This entry was posted in Declutter, House and tagged books, decisions, donating, guilt. Bookmark the permalink. Thanks for thoughtful words on book culling. It’s easier to give books away if one keeps a Books.doc file with author, (year published), title, place published & publisher. Mention the date you finished & scribble a comment or two. Then give it away. Martha & I plan another cull when refinishing the living room. We’ll lay hundreds of books down & photograph their covers. Then, ‘Bye-bye books!’ Sometimes we leave them on benches near Clayport Library or the train station, to find happy homes. Do you just leave them or do you use BookCrossing? I used to find it really hard to leave books because people kept running after me telling me I had left a book behind! A lot of people use the photography idea with clothes that have sentimental value. They put them on take a photograph and then pass them on. If I did that I would just hoard photographs. So off they go! I sifted mine at the beginning of the year, and I think I will sift again. I lost all my childhood books cos my brother (who was living alone in the family home at the time) stuck them all in the shed, the roof collapsed and ALL my childhood possessions, my dolls, my books, my artwork, everything was ruined. He didn’t sift through it for me, just binned it. I was mortified then and feel mortified again now. But in actual fact it saved me from worrying about whether I should bin them or not now. You really hit a nerve! I love my books and have tried to be good over the years and many house moves, to reduce, reduce, reduce but I still have dusty academic tomes form my high school years as well as university! I live in France and have tried to give away to the local library but they say they have enough books in English (they don’t, believe me), I’ve given loads to friends and tried to give them away at car boot sales but no one seems to want them. There aren’t any 2nd hand shops around here nor charity shops, so as there’s no way I’m putting them in the bin, for landfill (total sacrilege) they’re stuck with me for a while longer! I loved this post, whihc I found through the UBC. I look forward to reading more. Why don’t you just start leaving books at stations and cafes etc. Even if it was just one a day it’s a start. Or set up your own second hand bookshop! Maybe bookmooch.com is an idea? Though you have to pay costs for sending books (and use those points you then get, to ask other people for books – so it doesn’t help to reduce your book pile, but it’s useful for if you want other books to read). Maybe you can turn them into Bookcrossing books and leave them at places where many foreigners come (who probably speak English), maybe train stations? Books – To cull or not to cull? That is the question! That post made a lot of sense, but I’m not ready to pay heed yet! I love my books too. But I don’t think I have it in me to give them away. I’m not even ready to lend them. It feels too much like giving away a part of myself. Someday I shall, but I’m not ready yet. There is no point decluttering anything until you are ready. Otherwise it will be a painful and unpleasant experience and you will make catastrophic mistakes and never declutter again. It will happen eventually, when the time is right. There are lots of good book exchange programmes (like the Books for Free scheme run by Healthy Planet based in the UK) which are good for people like me who get through a lot of books but don’t necessarily have room for them all at home. The Kindle is great for the shelf space issue too. I’m also very lucky to have access to a lot of good libraries which stops me hanging on to things! 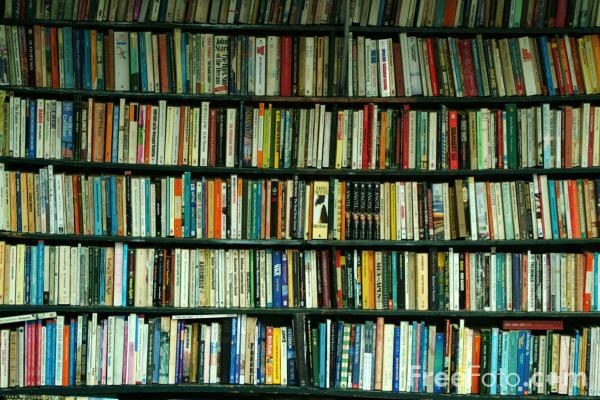 I grew up in a house laden books, and I loved to read them. Even now I love to go to my parents house, and find something to read. But. I’ve never read a book twice (at least not intentionally) and I’ve never had the space for wall to wall books. So I read, and pass them on. In fact, now I tend to read on my kindle which is good and bad. No more clutter but no sharing either. We just took loads of books to the school summer fair. I kept a few special ones and some cookbooks. But not many at all. I would actually love to have some books to dust. 😦 Ours are all in storage. 250sqm of bloody storage. The work begins tomorrow, you WILL hear me scream from London !! Oh, Gillie! Now that’s a challenge for a book-addict like me. You’ve laid down the gauntlet very firmly; shall I pick it up? Books. Not that was a challenge! The are our one great weakness. But we too have thinned them out, and find we don’t miss the departed ones! Some books, for me, are just more than books and I could never get rid of them. For all the others, well, there is the Kindle now, right? Indeed. But I had a lot of books that were just books and they were just gathering dust! I reread a lot, but I also have a lot of books! And I borrow a lot of books as well (from the library and from other people). I do only keep books if I want to reread them again, so that’s what I use to decide whether or not the book can stay in my bookcase. I started buying more books when the library didn’t have the kind of books I wanted to read, as I wanted to read more books in their original language and the library mostly had Dutch versions of those books, or didn’t have them at all. So if I wanted to read them, which I did, my only option was buying. To keep track of the books I have (as well as the books I still want to read), I use http://www.librarything.com , which is a very useful site for me: I can also give the books tags so I can easily sort them and see what kind of books I have duplicates of (Librarything also notifies you if you have real duplicates). It is much harder if you have a niche interest or want to read in a specific language. But you can still pass on the books once you have read them. It is rare that they will be read again and then somebody else in the same situation as you can have that Aahhhh moment when they find your book in a second hand bookshop! Yes, I pass on a lot of my books 🙂 I sometimes find books in other languages here in the 2nd hand bookstore too (Japanese, Ancient Greek) which are impossible to find in normal bookstores. It makes me happy when I find such books, so I pass on my other-language books too! I also turn them into Bookcrossing-books or bring them to the 2nd hand store or to the give-away store (a “store” where people can drop stuff off and take away stuff for free). Gillie, this is a good post. I have really culled my books. I have an Ikea Expedit 5X5 bookcase and 11 of the 25 squares are empty of books and another 5 are not full. Three of the squares are full of scrapbook albums. So my actual books don’t take up much room. I”m really excited about that. Would dump a few more if Mom would agree. She did let me get rid of 35 the other day. Another scrapper! Tell me do you scrap more now that you have easy access to materials? I started in 2000. There was almost nothing available in the UK and I scrapped regularly. Today I have a shedload of stuff and I hardly scrap at all. It’s too time consuming to work out what I want to use…. I no longer scrap much at all and I have gotten rid of $100’s worth of supplies–sold, gave away. I have only kept a few tools and a few other supplies. I went from a scrapbook room to a couple of small drawers worth. Gillie, I am over here because of a link posted on 365 Less Things. And I am so glad that I came. Decluttering books is something I think about a lot. I have gotten rid of quite a few already but long for insight to further diminish my stacks. You helped me go one step further because I had not recognized a fault I had until you articulated it. I had not realized how many books I had for the purpose of what other people might think about me. (I do tend to judge people by the books they have!) What a useless trap! This will definitely help me cull more. I would love to affirm you also on turning away from a high-powered career to focus on being a mum. If one has the means to choose that it is really is quite wonderful. I commend you for it. When we bought our house and moved a year and half ago I was ruthless with my books. I am a librarian…I have a book shelf or two or three…. Afterwards there was actual SPACE on the shelf, not just packed to the gills with books so tight it was hard to pull them off the shelf! But, I can see that I have been filling them up again. The spaces are gone. Perhaps I shall go be ruthless again. I know just what you mean about the space. That was the thing that I loved most of all, I could see between the books, and like clearing out a wardrobe and finding new outfits I found loads of books I didn’t know I had!